Cupping Leaves on Soybean: Is it a Pest or a Pesticide to Blame? 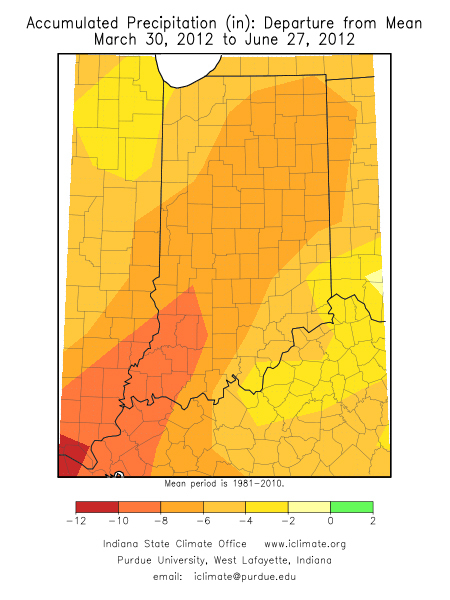 Questions and concerns about the potential of Indiana's corn crop are increasingly on the minds of growers throughout the state, especially in areas hardest hit by the current drought. Rainfall continues to be hit or miss as isolated storms rumble through the state, dropping decent amounts of rain here and there but missing large areas entirely (National Weather Service, 2012). The moderate temperatures enjoyed throughout the state since the end of May delayed the onset of severe drought stress symptoms in many areas, but those temperatures have recently climbed to above-normal levels and, coupled with excessively dry soil conditions, increasingly reveal the severity of the situation in field after field. Areas in the state have already “gone over the brink” to disaster status relative to yield potential. Eighty seven percent of the state is currently estimated to have subsoil moisture content that is rated short to very short and is higher for this time of the season than any year since 1988 (USDA-NASS Indiana, 2012). 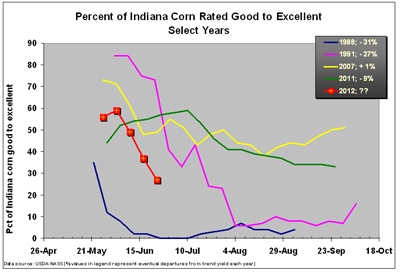 Estimated crop condition continues to worsen; down to 27% good to excellent as of 24 June 2012 and is lower for this time of the season than any year since 1988 (USDA-NASS, 2012). 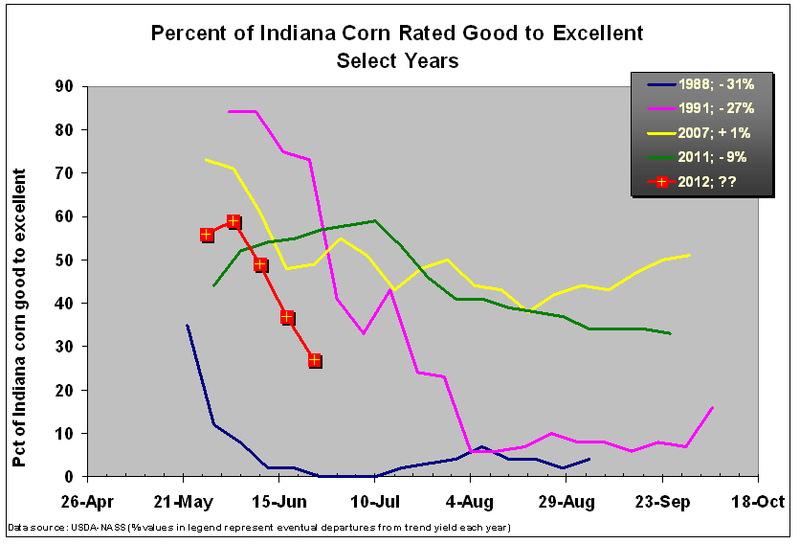 Percent of Indiana rated as good to excellent conditions as of 6/24/12 (USDA-NASS). For some, the effects of the drought began after planting in fields where seedbed moisture was simply inadequate for germination and emergence of the crop. Large areas in these fields are simply devoid of corn or soybean plants. With no rainfall after planting, many farmers elected not to attempt replanting knowing that the second attempt at establishing a crop would not be successful. The lost yield potential in such fields obviously cannot be recovered. 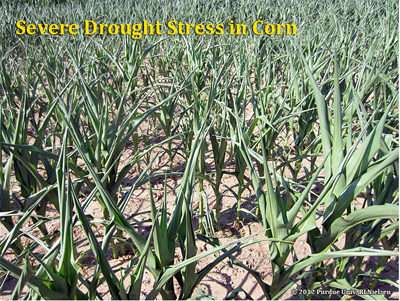 For other fields where initial stand establishment was satisfactory, the severity of the drought stress on crop development has slowly become worse and/or has escalated in recent weeks as the combination of drought and heat stress worsens. The severity of the stress is such in some fields that plants are simply dying. Some growers have already worked with their crop insurance adjusters to assess the yield loss potential of their damaged fields and have basically abandoned the crop for this year. This early in the season, it is difficult to estimate the effects of the drought on the eventual statewide average grain yield because we cannot accurately forecast the weather for the remainder of the season. 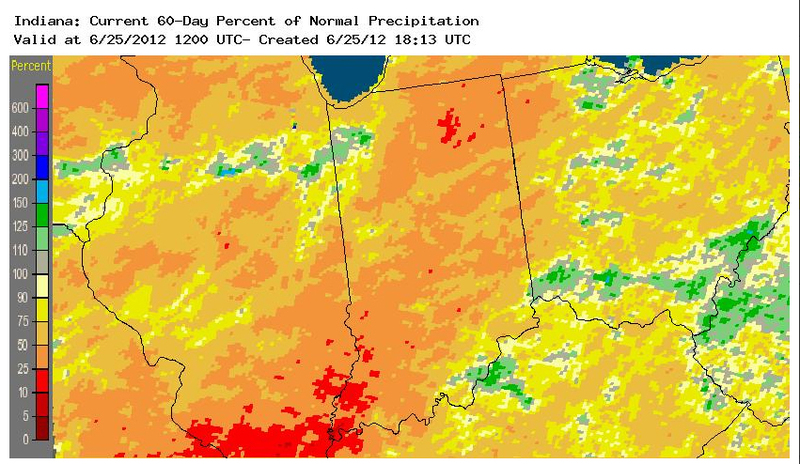 Trend yield with “normal” weather for corn in Indiana for 2012 would be 163 bushels per acre (bpa). There is a moderate linear relationship between crop condition ratings (percent good and excellent) throughout June and grain yield at the end of the season that accounts for about 33% of the variability in historical grain yields. Based on that relationship alone, the predicted statewide average grain yield for corn as of the end of June would be 145 bpa or nearly 11% below the trend yield. However, if the drought continues and crop condition worsens, this estimate would quickly become outdated. For comparison, statewide grain yield for the drought years 1988 and 1991 were 31% and 27% below trend yield, respectively. Much of the state’s corn crop will enter the critical pollination phase over the next two or three weeks (Nielsen, 2012b). Continued lack of adequate rainfall during this period will place undue stress on the crop. Forecast excessive heat during the same time period will only amplify the stress; resulting in delayed silk emergence, premature pollen shed, tassels failing to emerge from whorls, potentially inviable silks or pollen, poor synchrony between exposure of silks and availability of pollen, incomplete pollination success, or abortion of newly developing kernels. Yield loss per day during pollination due to severe stress is often estimated to be 5 to 10 percent. 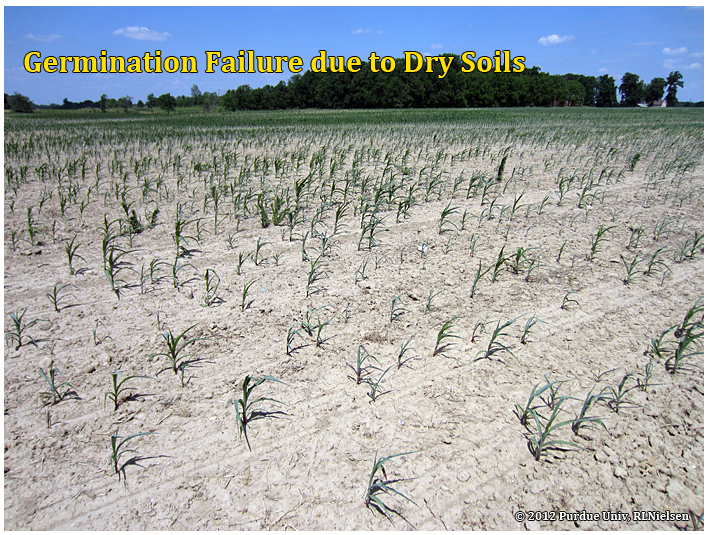 Yield loss for any given field could easily approach 100 percent with continued drought/heat stress due to complete failure of the pollination process. Growers who elect not to abandon drought-stressed fields prior to pollination will be wanting to assess the yield potential of their fields prior to harvest in order to estimate the potential loss of net income and/or to revise their grain marketing strategies for this fall. Assessing yield potential for an individual field cannot be done with any accuracy prior to pollination, but rather depends on assessing kernel set later in the grain filling period. The challenge with assessing yield potential of drought-stressed fields is that of obtaining ear samples that adequately captures the variability of the yield potential throughout a damaged field. Given the severity of the drought stress in some fields, growers may want to assess the success of pollination itself within the first week after pollen shed by sampling ears and conducting the so-called “ear shake” test (Nielsen, 2012a). This assessment simply gauges the degree to which pollen successfully fertilized the ovules on the ears via the silks, but does not predict the risk of kernel abortion in the few weeks following pollination or estimate grain yield. However, the test will at least give you an idea whether pollination was an absolute failure or was moderately successful. Unfortunately, there will be fields that appear to be only moderately stressed according to windshield surveys that, in fact, are severely stressed to the point that pollination will be a near or total failure. Better to find out the bad news soon rather than be totally shocked later in the season. Assuming that pollination occurs successfully, then pre-harvest grain yield estimation revolves around kernel abortion and grain filling. Unfortunately, one cannot begin to estimate grain yield for an individual drought-stressed field until the crop is beyond the milk stage of the grain filling period where the risk of kernel abortion tapers off. The risk of kernel abortion is greatest immediately following successful pollination and decreases to nearly zero by about mid-milk stage of grain fill (Nielsen, 2011a). Once the crop reaches or surpasses the dough stage of grain fill, the “ballpark” grain yield potential can be estimated by documenting effective plant populations and sampling ears throughout the field (Nielsen, 2011b). Pray for rain or turn on the irrigation. National Weather Service. 2012. AHPS Precipitation Analysis. <http://water.weather.gov/precip> [URL verified June 2012]. Nielsen, RL (Bob). 2011b. Estimating Corn Grain Yield Prior to Harvest. Corny News Network, Purdue University. <http://www.kingcorn.org/news/timeless/YldEstMethod.html> [URL verified June 2012]. USDA-NASS. 2012. Crop Progress. USDA Nat’l Ag Statistics Service. <http://usda.mannlib.cornell.edu/MannUsda/viewDocumentInfo.do?documentID=1048> [URL verified June 2012]. Dr. Bob Nielsen, Purdue Extension Corn Agronomist, visits a drought stressed cornfield during pollination in west central Indiana. Shown and discussed are the symptoms of drought-stressed corn and the skewed synchrony of tassel and silk emergence leading to poor pollination. Unfortunately, for this cornfield, the prognosis is not good. Dr. Bob Nielsen, Purdue Extension Corn Agronomist, visits a cornfield during pollination in west central Indiana. Shown and discussed is a quick-test, by dissecting and shaking the corn ear, to check the progression of pollination. This test determines the success of ovule (kernel) fertilization, but cannot be used as a yield estimate. Fertilized kernels, if subjected to stress (e.g., drought) may still abort or poorly fill, causing reduced yields. 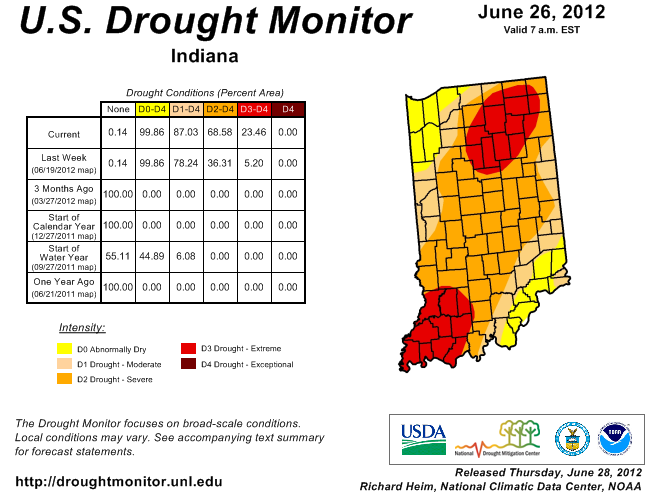 We are in the onset of a substantial drought in various regions of Indiana with rapid expansion across the state. 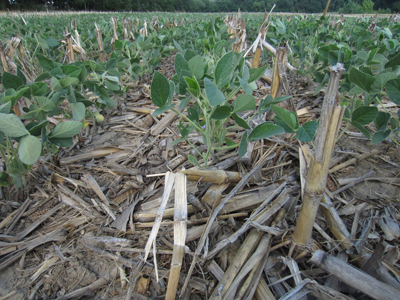 Drought-stressed soybeans are usually not as visually dramatic as drought-stressed corn. 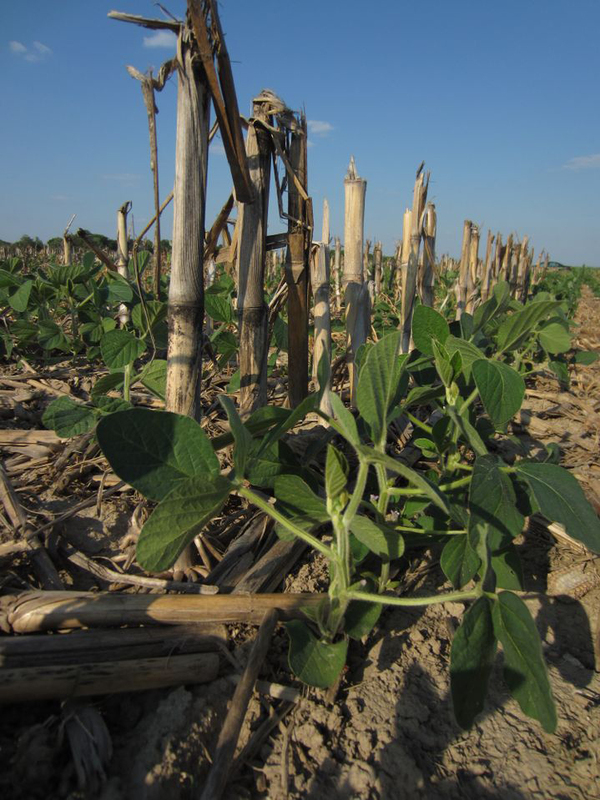 Soybean’s response to drought (heat and water stress) occurs at various levels including cellular structures, metabolic processes, and physiological development. As you can imagine, these are interrelated with direct and indirect effects on visual appearance. I would like to describe and show some of the most common signs of drought stress in soybean during the early season. The first signs of drought stress in soybean is difficult to see from the roadside, and it is somewhat challenging to assess in the field. Leaf expansion rates are reduced under drought stress, so leaf size tends to be smaller under drought conditions. This may seem like a natural conclusion, but it is difficult to pick up on it early. We usually notice this sign of drought stress after several weeks have passed by and the soybeans do not appear to be growing (Figure 1). In fact, the early season stress will cause the soybean to shift more of its energy and efforts to root development with limited vegetative growth (Figure 2). Figure 2. Soybean with limited vegetative growth due to drought stress. This is a close-up of the same field in Figure 1. The leaves are smaller then normal resulting in limited row closure. 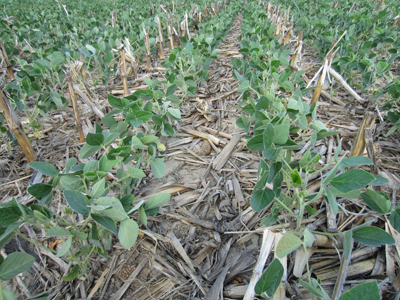 Vertical drowth was limited and soybeans were shorter than the corn stalks that were 8 to 10 inches. The more obvious sign of soybeans responding to drought stress is leaf flipping (Figure 3). This is somewhat analogous to corn rolling. Soybeans will literally flip the leaves to reflect more sunlight by exposing the silver-green underside. This conserves water by reducing the temperature stress experienced by the plants. You can think of it as soybeans’ version of a windshield reflector for your car. Secondly, water is conserved by reducing the photosynthetic rates (less absorbed radiation). The dark green topside of the leaves absorbs more sunlight, which would require water to satisfy photosynthesis (Figure 4). One indication of the severity of the drought stress is the occurrence and the duration of the leaf flipping. In other words, if it occurs early and often the severity is worse. Figure 3. Field of soybeans flipping their leaves to the underside that is a silver-green. Figure 4. The silver-green underside of the soybean leaves are reflecting sunlight to conserve water, while the dark-green topside is absorbing more sunlight. 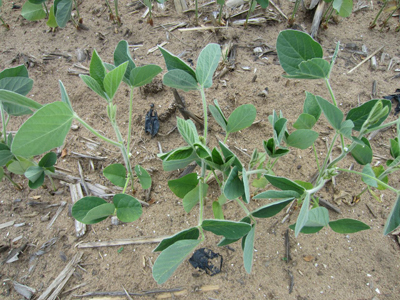 Severely drought-stressed soybeans will progress to “leaf clamping” (Figure 5). The outer leaflets of the trifoliate will start to close or clamp together to reduce the leaf area exposed to sunlight and to reduce water loss. In severe cases, the center leaflet (of the three leaflets that make up the trifoliate) will be sandwiched between the outer leaflets as they clamp down. The leaflets of young trifoliates (leaves emerging from the terminal bud) will even fold on themselves like a taco (Figure 6). 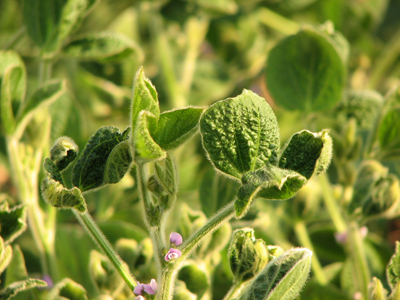 Leaf flipping and leaf clamping can occur throughout the growth of soybeans from emergence to seed fill. Figure 6. Limited leaf expansion, flipped leaves, and clamped leaves of severely drought stress soybeans. Notice the drought-severity of the volunteer corn. Figure 7. Early flowering of soybean due to drought stress. These soybeans are at V3 (3 expanding trifoliates). The first flower is at the first trifoliate, which is only a few inches above the soil. If the flower is retained and the pod develops and fills out, this will also be the height of the first pods at harvest. 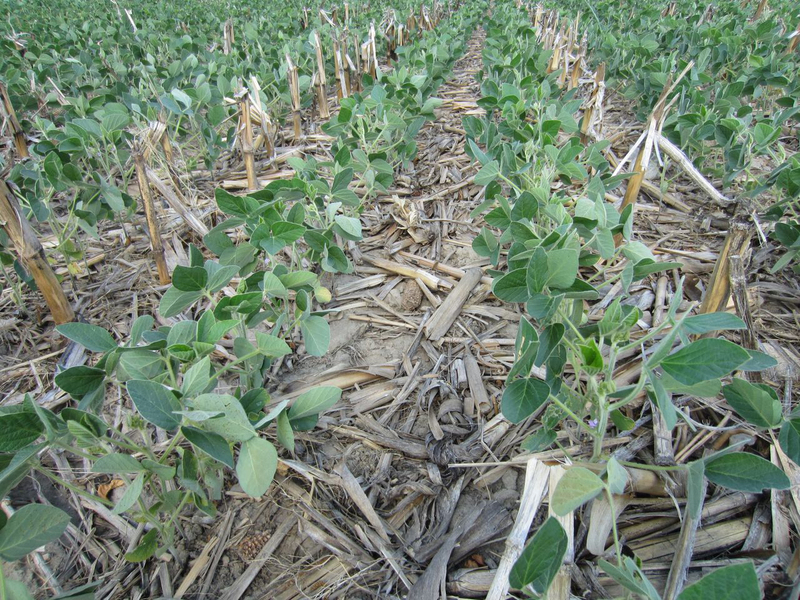 Notice the corn stalks compared to the soybeans height. Drought stress can cause young soybeans (V3 to V5) to initiate flowering and reproductive growth sooner than is typically expected. The plant is moving into survival mode with limited resources available for vegetative growth (Figure 7). Implications of early season drought can be long-lasting or short-lived in soybean. 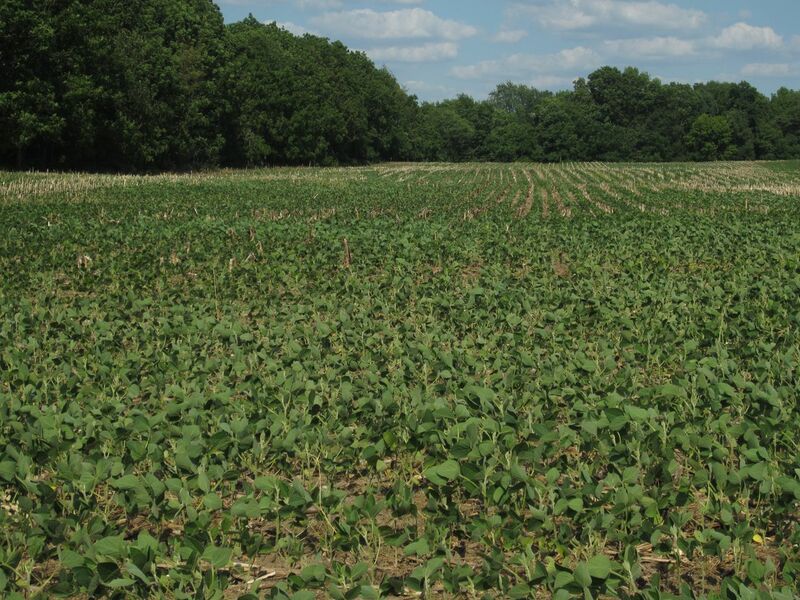 Many of our soybean fields are limited due to drought because of reduction in photosynthetic factories (vegetative biomass) in addition to limited nodal production. 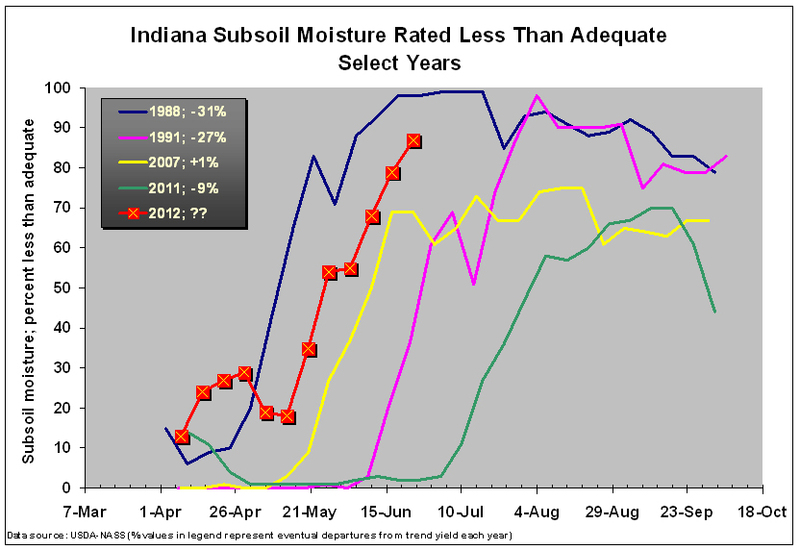 Fortunately, soybean has a larger grace period than corn in terms of the drought response. We may be short on node production, but we still have an opportunity (with return of moisture) to make up ground in yield through flowering, pod development, and seed fill. Dr. Shaun Casteel, Purdue Extension Soybean Agronomist, visits a drought stressed soybean field in north central Indiana. Symptoms of these V6 and R1 water-stressed plants are reduced height and flipping of leaves. Leaf flipping, which reveals a silvery color, increases sunlight reflection to reduce water loss from the plant. 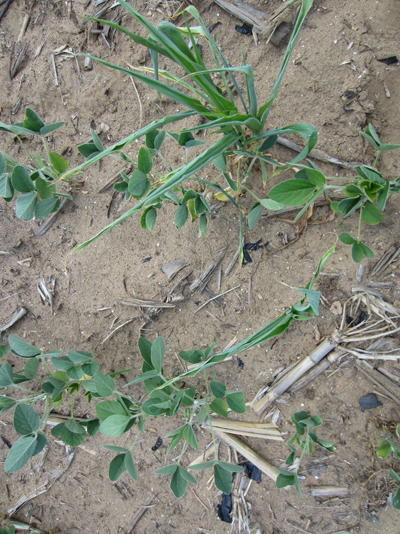 Severely stressed plants will exhibit a “clamping” of trifoliolate leaves, which greatly reduces plant photosynthesis. Dr. Shaun Casteel, Purdue Extension Soybean Agronomist, visits a drought stressed soybean field in north central Indiana. 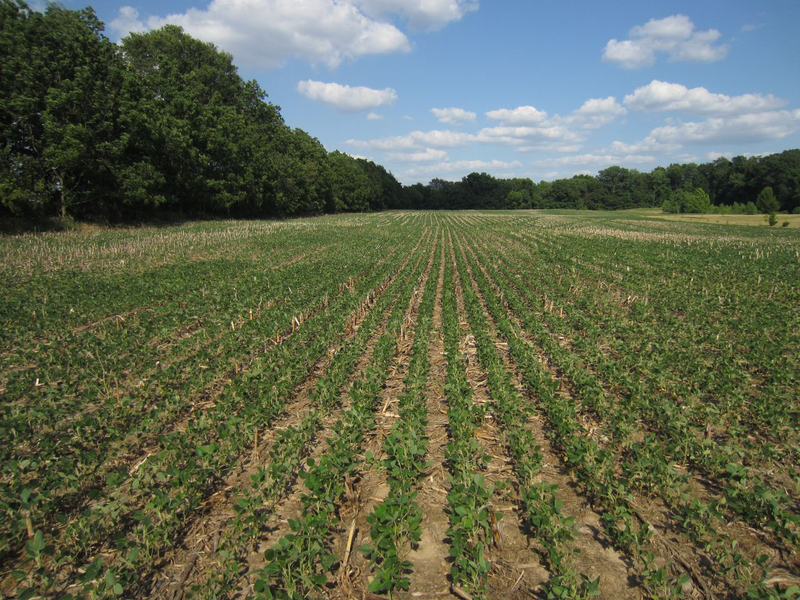 This later-planted soybean field was planted into soils that were becoming dry from lack of rainfall. This soybean stand is quite spotty, depending on the seed to soil moisture contact when planted. Emerged seedlings are putting early energy and growth into root development to find moisture. Soybeans across Indiana are curling and cupping and may have a mottled appearance. In some cases, these soybeans are also under drought stress, or suffering from other disorders. While it is easy to look at cupping and curling symptoms on soybean and claim injury from a growth regulator, it is much more difficult and important to determine the origin of growth regulator herbicide injury or determine if it is a viral disease that can cause a similar symptom. 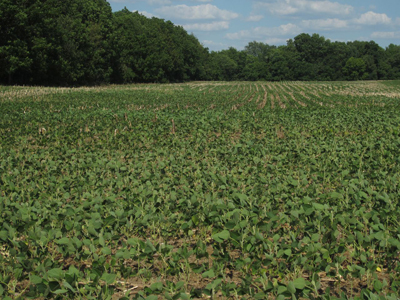 When looking at soybean fields with these symptoms, use the following information to determine if it is a pest or pesticide issue. When soybeans are exposed to low doses of growth regulator herbicides the plant leaves will cup, strap, and drawstring at the point of newest growth, rather than twisting and epinasty of stems that would be associated with lethal doses. The cupping and strapping can take up to two weeks to show up in an affected field. The sources of low dose growth regulator injury on soybeans are drift, volatilization, tank/boom contamination, or a combination these sources from growth regulator herbicides used in corn, pastures, fencerows, and home lawns. Distinct patterns in the field of changes in injury severity, and other susceptible plants in the field and surrounding fields can assist you in determining the source of contamination. A field that received drift will have the most severe injury closest to the source of drift. Broadleaf weeds in the source field will have the twisting, curling, and epinasty expected with a full dose application. If the drift occurrence occurred across a road or fence line, look for twisting and curling of weeds in the ditches or fence line between the fields. Volatilization can be a little trickier to identify than a drift occurrence, especially if both occurred at the same time. Look for injury patterns that follow air current pathways and changes in elevation. Injury occurring in low lying patches or valley’s can be an indicator of growth regulator volatilization. As with drift, a source field of volatilization will need to be identified by looking at surrounding fields, pastures, and road side could have potentially received a growth regulator herbicide application. 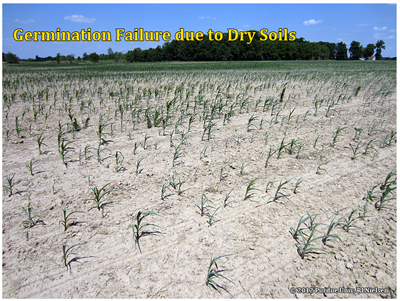 Contamination of sprayer tanks and booms with a growth regulator herbicide can also be difficult to diagnose as the area’s surrounding the immediate field will not show the signs that volatilization and drift show. Growth regulator injury from a boom that was not properly cleaned can be obvious as lethal damage will be evident where the sprayer was turned on and injury will become less severe with the distance traveled. Looking for distinct lines of the sprayer path will also indicate a growth regulator contamination of the boom. Tank contamination will typically result in fairly equal distribution of injury across the field. Use spray logs to identify fields sprayed prior to the injured field with potentially the same spray batch and look for injury in those fields as well. In some cases a sprayer that is allowed to sit over night or extended period of time with a loaded tank can cause growth regulators remaining on tank walls or plumbing to release into solution and become a contaminate in the next application. Soybean mosaic virus (SMV) can also be present in soybeans across the Midwest, and symptoms include curling, cupping, or crinkling leaves that may or may not have a yellow or light green “mottled” appearance. Leaf margins may curl under, and stunting can occur depending on the timing of infection. Symptoms will vary with variety and environment, and are usually most apparent on youngest leaves during periods of cool weather. This virus is transmitted by seed and from plant to plant by many species of aphids, including soybean aphid. Seed transmission usually does not exceed 5%, but plants with the virus can serve as sources from which it can be transmitted by aphids to other plants. Infected plants commonly produce small, mottled, discolored seed. 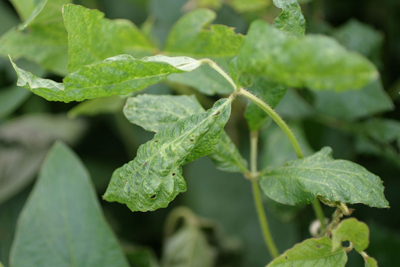 Bean pod mottle virus (BPMV) and Alfalfa mosaic virus (AMV) have also been reported on soybean and may have similar symptoms. To determine if virus is the cause of the symptom, samples must be collected and submitted to a diagnostic lab for identification. Research indicates that applying an insecticide to reduce aphid populations solely for SMV management is not effective, since aphid populations are not static and sprayed fields can be recolonized by aphids from other locations. Effective management includes planting virus free seed and timely planting of soybeans to avoid conditions that favor aphid transmission and disease development (late planting). Varieties may vary in their resistance to SMV. Soybeans in Indiana are under a high level of environmental stress in most areas. 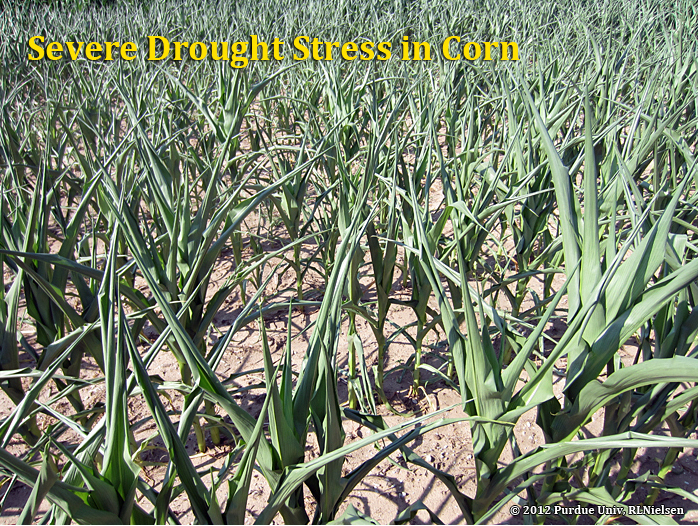 Drought-stressed plants may be exhibiting symptoms similar to disease or herbicide injury as a result of this stress. Although growth regulator injury on soybeans is going to be more obvious than in past years. it is important to find the source of the growth regulator prior to diagnosing cupped soybeans, otherwise only a statement of potential growth regulator injury can be appropriately made. Before jumping to conclusions on which pest or pesticide might be the culprit, be sure to get an accurate diagnosis by submitting a sample to a diagnostic lab for confirmation. Dr. Christian Krupke, Purdue Extension Field Crops Entomologist, visits a droughty soybean field in west central Indiana that is showing symptoms of spider mite feeding/damage along the field edge. Correct identification and scouting for spider mites is important, as other stress factors can cause discoloration of soybean foliage. Management options such as spot treatments, understanding the influences of rain, and pesticide choices if treatment is deemed necessary are addressed.